You're now subscribed to Daily Clips. "I begin my day with Progress Florida’s Daily Clips. It’s a great source for news on a wide range of issues. It should be a ”must read’ for everyone." Let Progress Florida Education Institute brew up your morning cup of knowledge with Daily Clips! Each weekday morning, we delve through dozens of news sources across the state and nation, with a discerning eye for the stories that matter to Floridians, and send a single news clips digest directly to your inbox in an easy to read format. 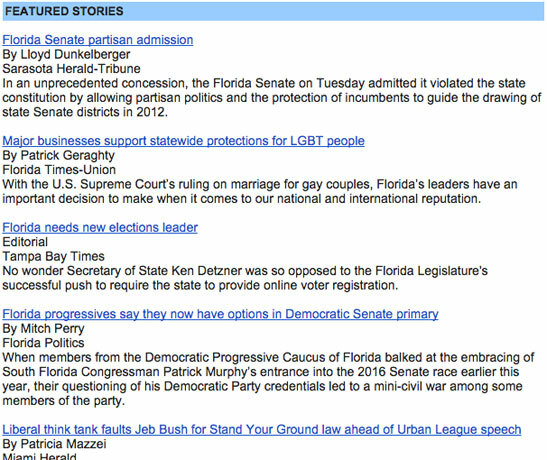 If you want to stay current on Florida news and politics, you can't start your day without Daily Clips! Fill out the form to start receiving this popular free service. Here's a quick preview of what you'll receive in your inbox. Daily Clips is divided into issue based sections including Environment and Energy, Education, Health Care, and more.